Top tips on how to shop for jewelry - You’ll get comprehensive information on how to pick the perfect piece of jewelry as well as basic rules to follow when buying jewelry. Top tips on how to shop for an engagement ring – You’ll observe how to pick an engagement ring. Engagement ring tips - You’ll get details on how to choose a wedding ring including important dos and don’ts. Top tips on how to choose a wedding band – You’ll find interesting ideas for choosing a wedding band. Diamond scams and jewelry frauds – You’ll become familiar with common diamond scams you may face with as well as ways on how to avoid them. There are some basic rules to bear in mind so that you never go wrong in buying luxury jewelry. 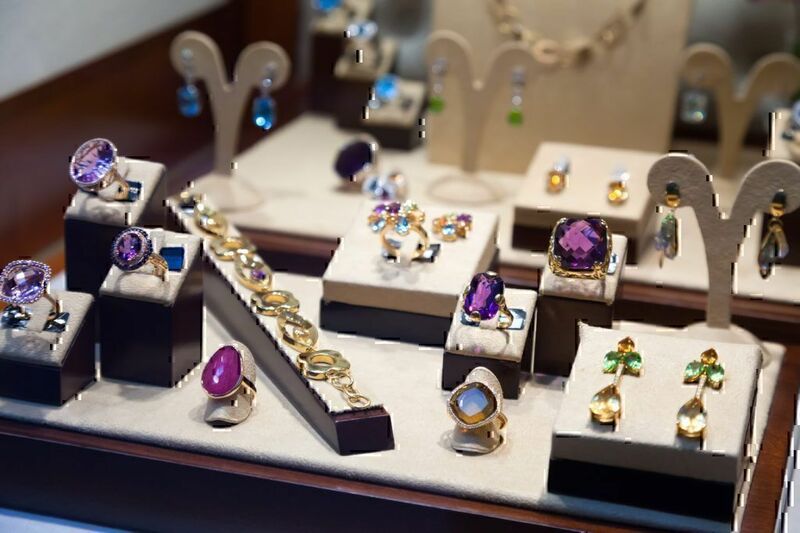 You won’t find a "natural"-colored gemstone in a jewelry store or set in a piece of finished jewelry (the piece that has been assembled completely). There are natural pearls however, they are extremely rare. In fact, many of the natural pearls bought from auction houses and respected jewelry stores are cultured pearls. So, if you want to buy pearls, you should definitely see a certificate of authenticity from an established business that specializes in natural pearls. 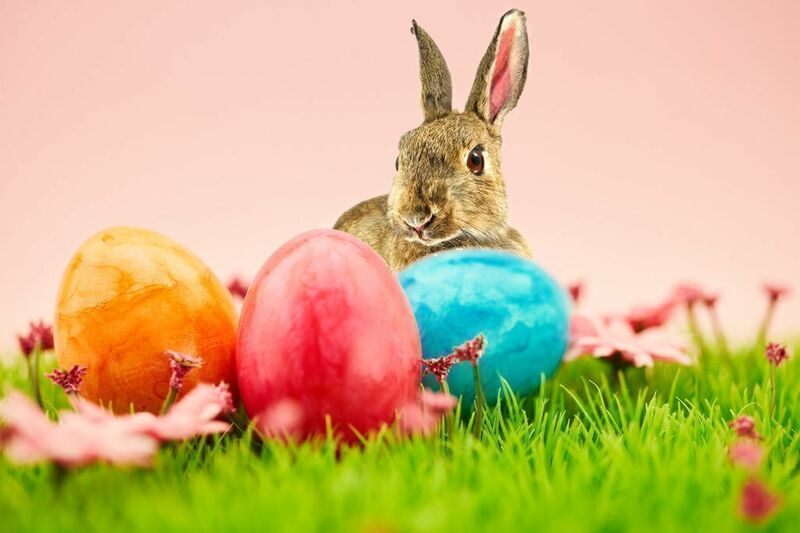 The same applies to gemstones – treated ones (that have been injected with colored glass or silicon, or irradiated (a technique to treat stones)) are sold as untreated, which makes them more expensive,. To guarantee that the gemstone you are purchasing has not been treated in any of those two ways, insist on full disclosure about how the stone got its color (get everything on paper), and ask to have the stone appraised by an independent expert first. If the disclosures are inaccurate, you should be able to return the stone. Stones under half a carat are usually set in a piece of jewelry. Before you inspect the piece with your naked eye and then with a loupe (some sort of magnifying glass), though, it is important to have it cleaned first. If the stone is large, ask the jeweler to pull it out for you. Most flaws (i.e. cracks and chips) are hidden under the prongs. Also know that jewelers use metal to improve the quality of their pieces, or hide their flaws. Most of the times, a brownish diamond is set in yellow gold prongs to make it look like a canary. Also, a stone completely wrapped in metal (aka bezel-set stone) is usually falsified in terms of proportions, weight, and color. So, if the jeweler refuses to pull the stone for you, it's better for you to leave. If you are buying a designer or antique piece, the jeweler may say that removing the stone will spoil the integrity of the ring. Not true. A stone set in a bezel can be re-inlayed by an expert jeweler. It is very easy to fake a stamp of a metal type (i.e. stamp that says platinum (Pt) on white gold or 18-karat on 14-karat gold), carat weight, or a designer's signature. To see if you are presented with the real thing, weigh a platinum piece in your hand. If there is a similar piece in white gold, ask for it too. The white gold should be a tad yellower, shinier, and lighter than platinum. Be very careful when buying a one-of-a-kind piece like a Tiffany. The craftsmanship of such fine pieces is extremely elaborate and leaves no room for imperfections. Inspect the piece under a loupe. If you notice crudeness or lack of attention to detail, stay away. Diamonds are certainly nice but very expensive. Being more affordable, pearls represent an iconic compliment to all styles and beauty. They come in three grades: natural, cultured, and imitation. Forget natural pearls – they are considered to be the rarest and hard to find. But even if you could find them, they wouldn’t be worth the sky-high price. The cheapest option are imitations. They are usually plastic and resemble nothing of the real item. So, the best option is cultured pearls. They are farmed and cultivated in a wide variety on the market. Looking for a nice strand of pearls, pay attention at their luster, sheen, and smoothness of the surface. The larger pearls, the costlier they will be. Cheaper pearls are usually dull and cloudy. It is better to avoid them. A lot of people do not even consider silver jewelry being taught to shop for gold only. But it is a mistake since silver is timeless. Any outfit will look good with silver. You can use different colors because silver will be a fair much for any color you choose. Moreover, silver provides a stronger contrast to a number of gems like topaz and amber. So, beauty may favor silver. Sterling silver is very strong, and it requires minimum maintenance. Shopping for silver jewelry, you should make sure that it is clearly tagged with the carat weight. Buy silver only from a reliable jeweler that can provide you with guarantees in writing and all required certificates. 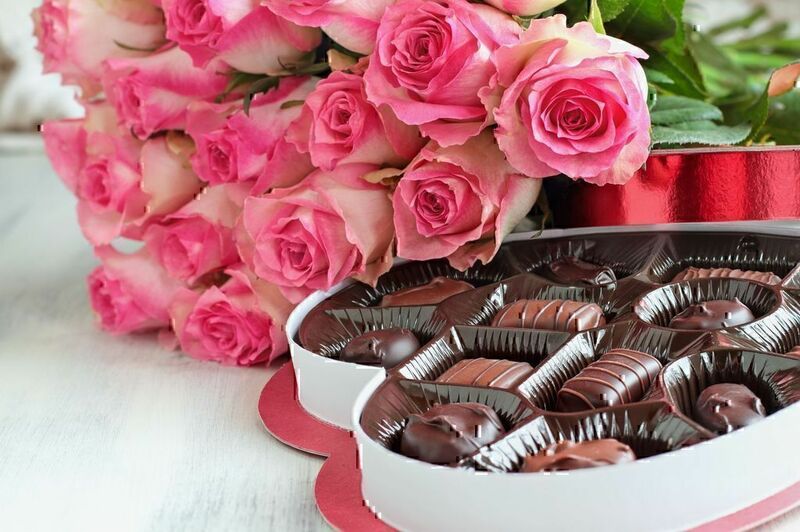 In case besides jewelry you want to order the best flowers, read how to choose the best flower delivery services. If you fancy a simple and elegant diamond showcased in a metal band, then you need a diamond solitaire. If you want the diamond surrounded by smaller diamonds, a halo ring will do. You may also consider a diamond engagement band instead of a ring with a larger center stone. That aside, there is always the option to have an engagement ring with side diamonds or color gemstones to inject color and dazzle – even color diamonds instead of white diamonds. 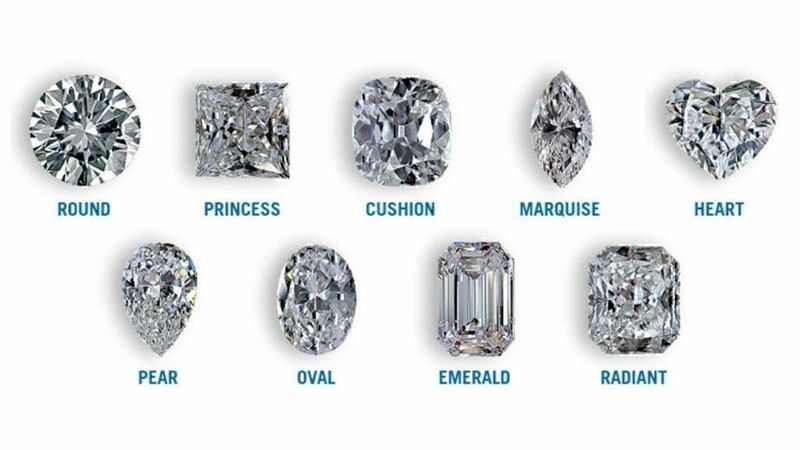 If you decide you want a ring with a center-stone diamond or side stones, your choices include: (1) Round, (2) Princess (oval cut with rounded corners), (3) Emerald, (4) Marquise, (5) Oval, (6) Pear, and (7) Heart (see image below). Platinum is the most preferred (also hypoallergenic) option of those that want an engagement ring with a modern flair. For more contemporary, softer look, white gold is a great choice. If you prefer classic look you may fancy yellow gold or the more romantic and unique look of rose gold. A more affordable option is silver (make sure it is marked 9.25 Sterling Silver). A prong setting delivers a clean and classic look while a channel setting gives extra flash and flair. For more a glamorous option, go after a pave setting. Finally, a bezel setting is ideal for those who are more into contemporary, yet striking, looks. The higher the quality of the diamond, the more beautiful (and costly) it is. Consider the 4Cs: (1) Color (the whitest diamond is a D grade), (2) Clarity (measures the number of inclusions (internal blemishes) a diamond has and that makes it look as if it is lit from within), (3) Carat Weight, and (4) Cut (well-cut diamonds have more play of dazzle and light). 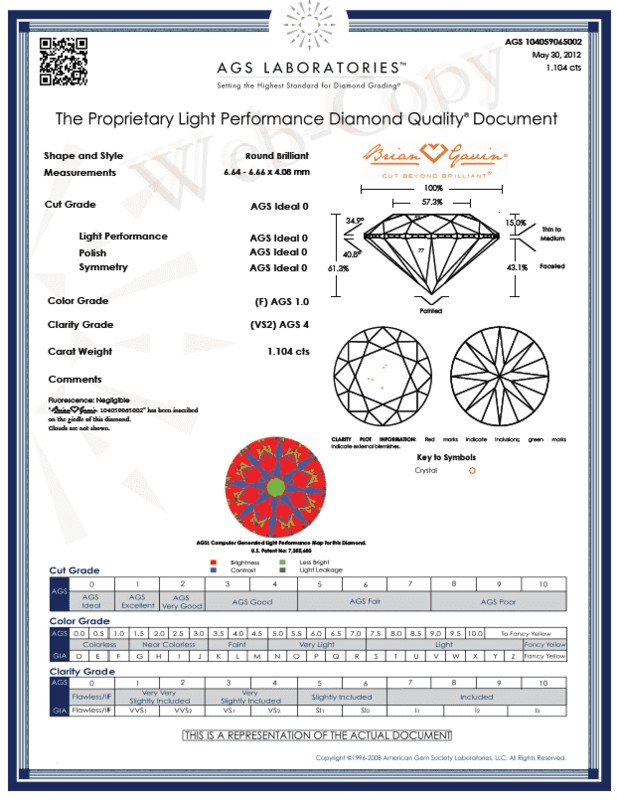 Take a look at the diamond with a loupe and see how precisely cut the angles of the diamond are then compare it to diamonds graded at lower and higher quality. There are some tips to steer clear of troubles and to avoid scams when buying engagement rings. 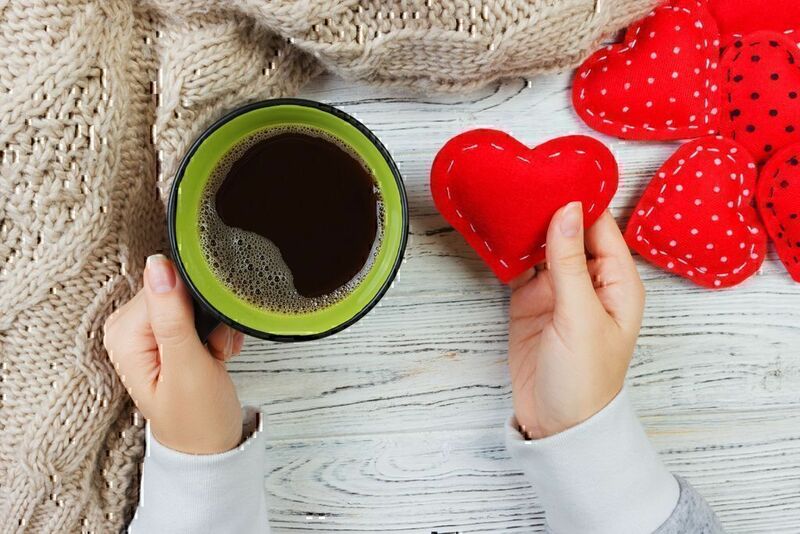 Below there is a list of what you should focus on, as well as things you should avoid. 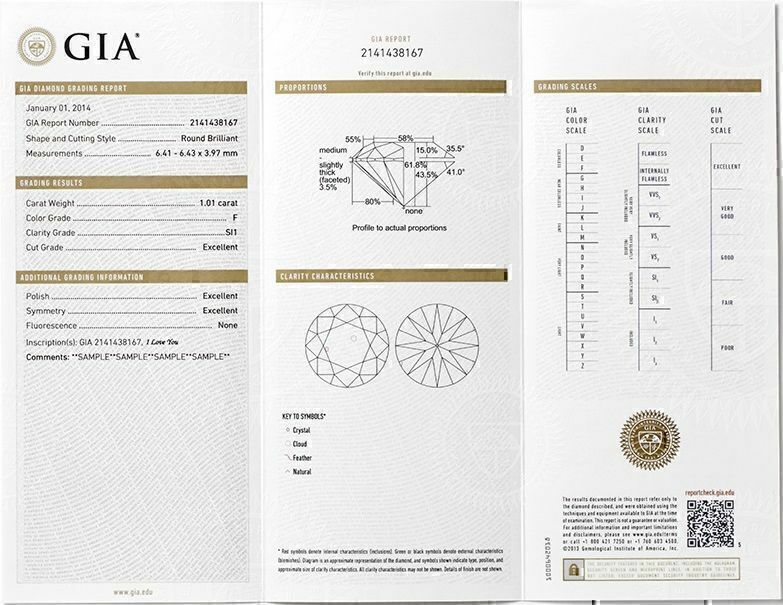 All certificates, including the American Gem Society (AGS) and Gemological Institute of America (GIA), can be faked. Check your stone (colored stone like tsavorite or sapphire, or diamond) against the certificate. Then, check the measurements (ask for a millimeter gauge). Finally, check the weight (ask for a scale) and ensure the imperfections shown on papers are the exact same imperfections you see with a loupe. If you are to spend thousands of dollars on such a purchase, everything has to be checked out. "I had a BEAUTIFUL rose gold ring that I got for Christmas and I knew it was only dipped rose gold so I would have to get it redipped every few months, which I was fine with. I wore it for a couple of months […] and […] turned it in to get it resized. 6 weeks later I received it only for 24 hours later the rose gold had completely come off!..." All diamonds, even those that are poorly cut shine in the sun after they are cleaned. Unless the jeweler is willing to write you a paper guaranteeing to buy the ring back in 12 months at a 5% premium over what you will pay, don't believe that you are buying jewelry as an investment. If you have not made it to the engagement ring part of the process yet, you can purchase bridal sets, which comprise of an engagement ring and a wedding band. Then, you may coordinate your wedding band and an engagement ring with a wedding ring for him. here are some ideas for choosing a wedding band for your personal style. Your wedding ring should match his but this is not the norm anymore. the wedding band just has to complement the engagement ring. It could have the same stones or you may mix colored diamonds or gemstones and white diamonds. The metals may also be the same but you can mix gold tones in the wedding band and engagement ring as well. Or you may choose a family heirloom instead. Besides yellow gold, white gold, and rose gold, there are also palladium and platinum. 24-karat gold is not usually used in jewelry as it is soft. For that reason, it is alloyed with other metals to boost strength and hardness. Yellow gold bands are also the easiest to repair. White gold is yellow gold been alloyed with zinc or nickel to get its white color and is usually plated with metals like rhodium. You will need to have it re-plated if it shows signs of wear. The blend between yellow gold and copper gives rose gold. Platinum is more expensive as it is rarer than gold; yet extremely durable. Palladium bands are more affordable options than platinum with a soft, satiny finish. There are also titanium wedding bands in smoky-gray shades. They are particularly durable but they cannot be resized. If you don’t like having a plain wedding ring, then go with stones. Although diamonds are the most popular choice, you could also opt for contrasting gemstones or color diamonds. Ensure the style of your wedding band is something you will probably want to wear for the next 30 years or so. However, you can always make changes to it later on (i.e. add diamonds) so don't stress too much over it. Gold and platinum wedding bands are easy to maintain (just rub with a soft cloth) while ones with stones need extra attention and maintenance (soak in warm water, gently brush with a soft eyebrow brush, rinse, and pat dry carefully). Your final band fitting should be at a time when your body temperature is normal and you are calm (means, no swollen fingers). Avoid morning hours, when the body has retained water from the night before, when very hot or cold, or after you have worked out. The band should have a quality mark (i.e. PLAT or 24K) and the manufacturer's trademark. Here are some red flags to bear in mind when buying jewelry and diamonds. It is among the most common diamond scams, where the tag on a ring or other pieces of jewelry do not state the total weights for each diamond separately. Instead, it writes the total carat weight of all the diamonds in the piece (a carat is a unit of weight for diamonds while Karat is a unit of purity). One large diamond costs way more than a lot of smaller ones of the same rating that equal total carat/weight with the large one. It is a common diamond scam targeted on consumers who are ignorant of diamond carat weight appraisal. The best way to buy jewelry is to shop with trusted jewelry retailers only. Many retail jewelers mark up diamonds 200% and even 400% and then stick a sticker with a 50% discount. In the end, not only you do not get diamonds at half the price but you also overpay. The best way to buy jewelry: Avoid sales that offer such significant discounts. If you think it rationally, there is no reason a retail store owner is willing to give away half of their stuff for free, especially diamonds. This is a common diamond scam. Rounding up a diamond's weight can cost you a lot of money and anyone who is doing that is performing a scam behind your back. Diamonds are weighed in carats and most people are familiar with the major weights related to them like ½ carat, 1 carat, ¾ carat etc. However, jewelers weight diamonds over a carat in carats AND decimals, according to the Gemmological Institute of America (GIA). So, a 1.05-carat stone would be described as one point oh five. Diamonds under one carat are stated in points (i.e. 0.90 carats is said to weigh ninety points). In the weight scam, the jeweler labels, for example, a diamond that weighs 0.65 carats as a ¾ carat one, which can cost you almost $1000. Sadly, after the diamond has been set into a ring, it is impossible to weigh. Best way to buy jewelry: Buy a certified loose diamond. Then, have a reputed jeweler set it. Fracture filling is a technique used to improve the quality of a diamond (and sell it at a higher price) and is usually applied to rings that have to be resized. However, the procedure may leave a crack on the diamond, which makes it prone to chipping and even falling into pieces. For that reason, fracture filled diamonds are considered worthless. "The middle stone was an emerald cut diamond with two side emerald stones and round accent stones covering the entire ring... total weight, 1.5 ct. Set in rose and white gold. It had to be sized.I was astonished at the clarity of the stone. The night we brought the ring home (two weeks to be sized), I noticed a very visable line (crack) going through the center of the main diamond. I showed my husband and he noticed it as well. We promptly went back the very next day and Jared insisted that it was an inclusion and had been there all along and offered me a free apraisal, surprise the ring was apprassed at $4500 (what the retail price was and what we paid for the ring.I was not convinced, so I took it to a reputable diamond retailer, and they confirmed that the diamond was infact cracked in two, and showed me with their microscope and plain as the nose on my face,a crack straight tbrough the middle of the main stone, rendering the ring worth only $317. " Although you can't tell a fracture filled diamond with an untrained eye, it is good to know that gem labs don’t issue certificates for such diamonds. And if they do, they clearly state that the diamond has been enhanced using this method. 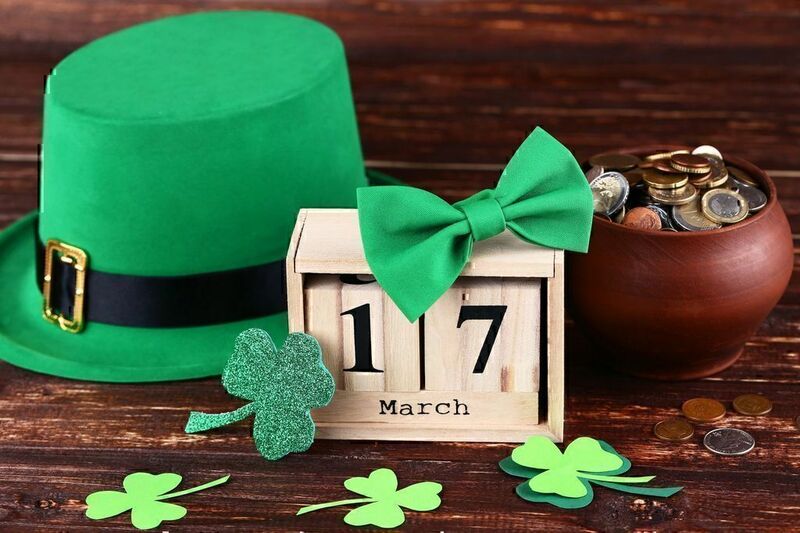 The best way to buy jewelry: Ask for a written statement regarding any enhancements the stone has undergone and always ask for a certificate from the GIA, EGL (European Gemological Laboratory), or AGS (American Gem Society). If you suspect that a jeweler has faked a certificate, report it to the gem lab in question. Major labs care deeply about their reputation and they will pursue the scam jeweler. Also know that whatever the certificate you are presented with (if from a lesser known gem lab), it should always be accompanied with a certificate from AGS, GIA, or EGL. For GIA certificates, cross-check the details in the report using the GIA online check tool has developed to help verify a GIA report. Fake or imitation diamonds are usually made from cubic zirconia, moissanite, or high-leaded glass. To the untrained eyes, these stones can appear like real ones until you inspect them more closely. Unscrupulous providers can sell such “affordable” diamonds that are merely simulants and nothing more. Remember, nothing is too good to be true in real life. Imitation diamonds are sold with a significantly lower price tag. They suffer a much higher rate of wear and tear. If compared to real diamonds, imitations have a different density and dispersion effect. You can use a thermal tester to distinguish cubic zirconia. If you purchase simulants, you should know it. "Helzberg strongly recommends you bring your diamond rings back to them for cleaning. Apparently, this also involves them substituting chipped diamonds for your flawless diamonds. They swapped a chipped diamond for ours and hid the chip under a post…"
The best way to buy jewelry is to do your homework when buying a diamond or an expensive piece of jewelry. Ask for a certification from a trusted gem lab, and make sure you get everything in writing before you leave the store. Hopefully, with the engagement ring tips mentioned above, and the many different ideas as to how to shop for engagement rings and how to choose a wedding band, you will get a really fine piece!